Posted on Wed, Feb 22, 2012 : 5:30 a.m.
February is “Adopt a Rescued Rabbit” Month. To help highlight our furry bunny friends, we’ve chosen Gabriella as our Ann Arbor.com pet of the week. 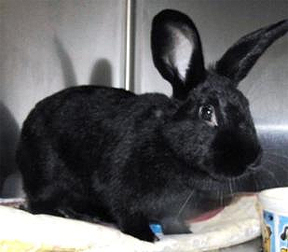 Gabriella is a 1-year-old, lovely black Rex rabbit. Gabriella is a very nice rabbit. She is intelligent, affectionate and inquisitive. She can be a little shy until you have earned her trust, and she prefers quiet, gentle interactions. She can be a good bunny pet for a family as long as she gets the attention and care she needs. She enjoys a nice diet of fresh hay, vegetables and good quality pellets. Gabriella was purchased for a small boy by his grandmother. It didn't take long for the initial excitement to wear off, and when no one in the family wanted to care for this sweet girl, she was brought to the Humane Society of Huron Valley. Impulse purchasing of rabbits as gifts is the number one reason they end up being surrendered to HSHV, and even though domestic rabbits can't survive outside, the second biggest reason we get rabbits it because people find them as strays in their neighborhood. Please seek help for your pet rabbits if you can't keep them. Animal abandonment is against the law, and most bunnies will not make it long outdoors on their own. Sadly, unwanted rabbits overwhelm many shelters and countless Michigan rabbit rescues are dedicated to bringing awareness to the plight of these discarded pets. The Humane Society of Huron Valley works with two local non-profit rabbit rescues, Great Lakes Rabbit Sanctuary and Midwest Rabbit Rescue. With Easter approaching, it's a good reminder to people that maybe getting a chocolate bunny as a gift is a much better idea. In fact, a national campaign called “Make Mine Chocolate” is helping bring the plight of Easter bunnies to light. Tim Patino from Great Lakes Rabbit Sanctuary is jumping onto this promotion. "This year we joined this sweet way to raise some funds for our organization with the Easter Chocolate Fundraiser on our website. We partnered with a Michigan Chocolatier to create affordable and adorable little chocolate packages with bunnies and baby chicks being the theme. This will help us build awareness and raise some cash for the animals at our sanctuary."